Mysterious and alluring, black diamonds are the rare and shadowy opposite of their more famous white diamond cousins. Instead of flashing scintillating light shards like white diamonds, black diamonds capture and hold light, absorbing the gleam into its intriguing, inky depths. For woman who has a taste for the unusual, the special and overtly different, silver black diamond jewelry is a must-have for her accessory collection. The contrast of an icy silver setting showcases the enthralling darkness of the gemstone. Found in alluvial deposits in Central Africa and Brazil, natural black diamonds are extremely scarce, the superlative of their kind. Gemologists approximate the rarity of black diamonds with the statistic that only one of every 10,000 jewelry-quality natural diamonds is colored, and those colors range from pale yellow or blue to black. Read more. The word �diamond� comes from the Greek �adama� meaning invincible. It is the hardest stone known to mankind and the black diamond is, because of its polycrystalline structure, thought to be the toughest of the diamonds. Imagine giving the remarkable woman in your life�who has just finished her degree, given birth to a child, or defeated cancer�a piece of stunning silver black diamond jewelry with the word �invincible� on the card. She would know in her heart that you valued her vibrant womanly strength and patience. The Black Orlov diamond is the most legendary of its kind, a 67.5 carat cushion-cut stone displayed at the Smithsonian Museum of Natural History in 1951�legend has it that the Orlov belonged to a Russian princess in the eighteenth century it was also known as the Eye of Brahma. Its lustrous darkness captured the imagination of museum-goers and its mysterious provenance confounded gemologists and historians. 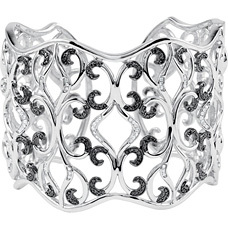 Silver black diamond jewelry proclaims the wearer an extraordinary woman, enigmatic and glorious. Treat the rebel in your life to a pendant or bracelet adorned with beguiling black diamonds set in silver.